Evelyn Moore was diagnosed with a tumor at 4 months old that left her paralyzed. Thanks to her ingenious dad, one tiny tot is zipping through life in her very own wheelchair. 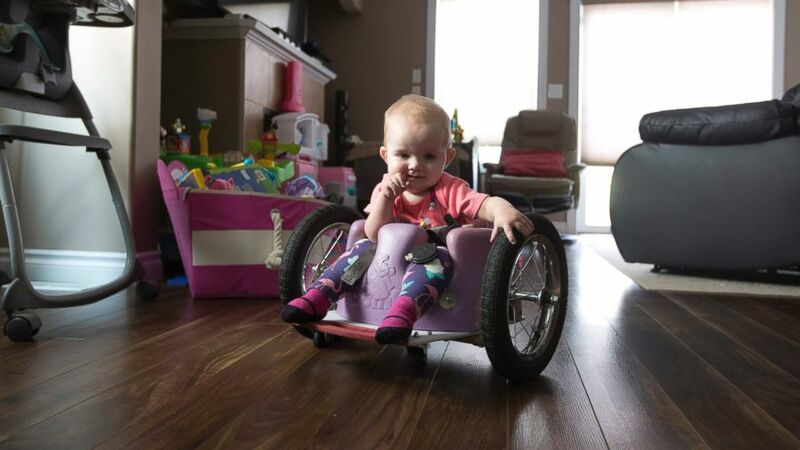 Evelyn Moore of Edmonton, Alberta, Canada, was diagnosed with a spinal tumor that left her paralyzed below her arms, so instead of learning to crawl, the 1-year-old is now perfecting how to wheel her homemade cruiser. "She's pretty fearless," Evelyn's mom, Kimberly Moore, told ABC News today. "She'll go in her wheelchair on the top of a hill, let go and put her hands in the air, then catch herself when she gets to the bottom. She's a good little baby. She's been through a lot and she's just trying to get back to what normal looks like." Evelyn was diagnosed with neuroblastoma at 4 months old and underwent eight rounds of chemotherapy. She has been in remission for 3 months, Moore said. Doctors told Moore that Evelyn would be able to army crawl and use a wheelchair later. But the Moores wanted their daughter to have as much normalcy as possible. "There weren't too many options that were available," Moore said of Evelyn's mobility. "When my daughter was diagnosed, we were more worried about keeping her alive than getting the insurance to get it [a wheelchair] covered. We saw something on Pinterest and Brad [my husband] said he could build it. Within a day or two, it was done." (Jason Franson/The Canadian Press via AP Photo) Kim Moore and her one-year-old daughter Evelyn Moore play at an indoor play ground in Edmonton Alberta, Canada, Aug. 9, 2016. Evelyn, also called Eva by her family, was diagnosed with cancer following her four-month check up. For $100, Evelyn’s dad, Brad Moore, made the wheelchair with a cutting board, castor wheels and a Bumbo chair, Moore said. Pediatric oncologist Bev Wilson of Stollery Children's Hospital in Alberta is one of Evelyn's doctors. Wilson told ABC News that the child's new wheelchair has made a great impact on her mobility and social life. "She's very happy," Wilson said. "She moves around and visits nurses she wants too see and other kids. She knows everybody. It's made her mobile in a way she otherwise wouldn't be able to be. She gets to explore what she'd want to explore. She's like any other child, but she's actually faster." In fact, Evelyn has gotten so speedy that her parents had to install a speed bump in their home to slow her down. "Her true person comes out when she's in that chair," Moore said. "She [now] has the same interactions as any other child would, being at eye level and exploring the world on the ground. ... That's what she is able to do in moving around. It's pretty exciting." Moore said that Evelyn's wheelchair is built to tip forward so she can reach down for her toys. Next month, Evelyn will be taking her wheelchair to "Camp Beat It," hosted by the Kids With Cancer Society.